Passez vos prochaines vacances dans cette belle maison construite sur le bord de la montagne à seulement 12 minutes en voiture des pistes et le village historique de Mont-Tremblant. L'étage principal (troisième étage) est un grand salon ouvert avec le feu fonction de journal, d'une cuisine entièrement équipée et salle à manger avec une belle vue sur la forêt et la montagne. Au deuxième étage, trois chambres dont une avec salle de bain et d'un balcon privé, d'une autre maison de bains et un sauna avec douche. Sur l'étage inférieur, il ya deux autres chambres: une avec un lit double et un lit simple, une avec deux lits doubles. Aussi une buanderie complète à cet étage. Nouveau! Accès WiFi. A l'extérieur, une piscine privée chauffée (ouverte de juin à septembre) et une grande terrasse. Il ya aussi un grand balcon avec ensemble de patio et de gaz Barbecue pour manger dehors. La région de Mont-Tremblant offre une grande variété de quatre saisons de loisirs, y compris, au cours de la station de ski l'hiver première descente de classe à plusieurs endroits, le ski de fond, des sentiers, patinoire extérieure, des tubes, tous les spas nordiques de l'année, etc. En été, le printemps et l'automne, il ya sept grands terrains de golf à choisir, le canotage, le lac de croisière, les vols à vue voyant, l'équitation, la natation, la pêche, la montagne et circuit vélo, et bien plus encore. Pensez à faire notre maison Mont-Tremblant votre maison pour vos prochaines vacances, réunion de famille, la famille élargie lieu de rencontre, ou de retraite d'entreprise. Peut-être que vous souhaitez réserver la maison pour un week-end ou plus? Nous aimerions recevoir de vos nouvelles! Great accommodation close to Mt Tremblant! We had an excellent weekend at the house. It was clean, fully equipped, comfortable, and close to Mt Tremblant. We visited the area for a ski weekend, so access to the hill and comfort were priority. Despite 13 adults staying here, there was plenty of space and we all felt right at home. Thanks Roger for an excellent stay! We spend a weekend skiing and staying at the house. Loved the sauna to relax after the day outdoor, and that there are proper comfy beds. Also enjoyed the fully equipped kitchen, so we could cook for all of us. The common area is well designed to fit everyone and bedrooms downstairs give you privacy whenever you wish so. The owner suggested a late check out, as the cleaning would not happen until later, and that was highly appreciated. We stayed here for 5 days and this house was exactly what was described. It was clean, and had everything we needed for our 5 days. Roger made it easy for us to enter the property and left instructions on what to do with the house. The house was perfect for what we needed and was made us feel comfortable our entire stay. The kids even mentioned how much they loved the house and wanted to stay longer. Definitely would rent from Roger again when we come back for another stay for either skiing or for Ironman. We were a group of 11 adults and one young child. I can say that we were very comfortable in this chalet. We went there to enjoy various winter activities and it was a joy. I don't think the pictures on this page do it justice, the common area is a lot of fun, very spacious. We were even treated to some deer in the backyard which we observed through the window in the staircase. I stayed at this property for a weekend to snowboard with my family at Mont Tremblant. We had such a great time! We were surprised when we arrived as it was clean and has a fully equipped kitchen for a large group. Linens and towels are also provided during your stay. The only thing you really need is to bring your own food. There is a grocery store nearby which is a 5 minute drive. They even have 2 washing machines and 2 driers. There is also plenty of board games to choose from so you won't be bored. The location is great as it makes you feel like you're in a secluded area. When you look out the window to view the back it's just endless trees covered in snow. One thing to note is that the place only has 1 bathroom with a shower, however there is a second shower located in the sauna (with no lock, so we just had to put a sock on the door to let everyone know it's occupied). The en suite only has a Jacuzzi. Also, please make sure you have winter tires as the house is located on a hill. If you don't have winter tires you may have fun trying to get up that hill. I had a van with no winter tires and we had to rip it up the hill to get up to the chalet. Quite scary as it's on a bend and you don't know if a car will be coming down the other side or not. So please save yourselves the trouble and have winter tires! Roger, the property owner, is super nice and very quick to respond with any questions you may have. Looking forward to stay here again in the future. PS. They allow dogs which is great! It's hard to find rental properties that allow you to take your furry friend so that's always plus. Thank you and hope to se you again. We had a wonderful time at this property ! We booked this property to bring our family from different locations, together for Christmas and enjoy some skiing at Mt. Tremblant. The house was beautifully decorated including a Xmas tree which really thrilled our little granddaughters(2 and 4 yrs). There was plenty of room for everyone and the kitchen was well appointed to allow us to cook a wonderful festive dinner. 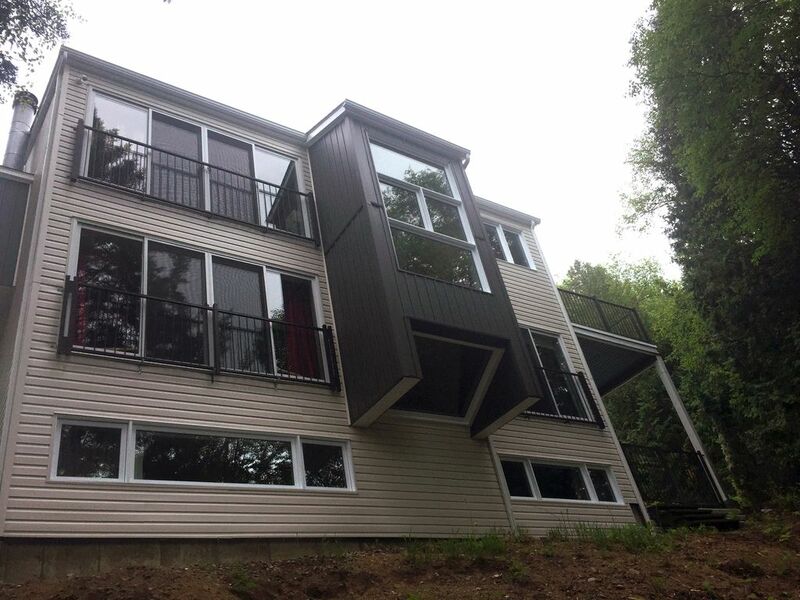 This chalet is well positioned with large grocery stores close by as it the wonderful ski resort of Mt Tremblant. Would highly recommend to anyone wanting a quiet and large chalet that has it all including a great sauna!! Thank you. Rates are subject to change until reservation.